homeless households in Newham are in temporary accommodation, the highest number in London. It also has the highest number placed outside the borough, nearly 1,700.
of working residents in Newham are low paid, the highest percentage in London. percentage point gap in GCSE attainment between Newham’s disadvantaged school children and those not facing disadvantage. Newham is in the top 4 London boroughs on this issue. Newham is a borough in the Inner East of London, which experiences significant problems with poverty and inequality. 35.6% of employees in Newham are low-paid, the highest percentage in London, and the poverty rate is 37% – ten percentage points higher than the London average and, among London boroughs, lower only than the poverty rate in Tower Hamlets. However, the number of affordable homes in Newham has increased by 1001 in the three years leading up to 2015/2016, which is the 4th highest increase in the capital. And while the unemployment ratio (6%) is the 5th highest rate in London, it has dropped by 3.8% over the last three years, which is the biggest decrease in London. Newham has one of the youngest populations in the country, as well as having a high proportion of BME residents. 43% of residents in Newham are Asian, according to the 2011 census. 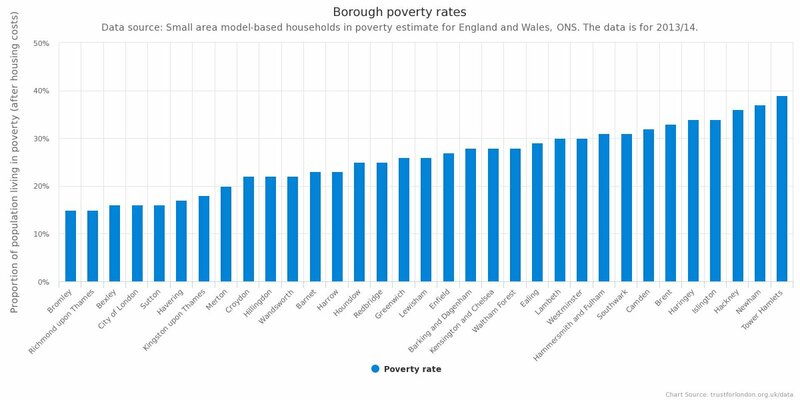 The rankings below show how Newham is performing on key poverty and inequality indicators, in comparison with all 32 London boroughs. 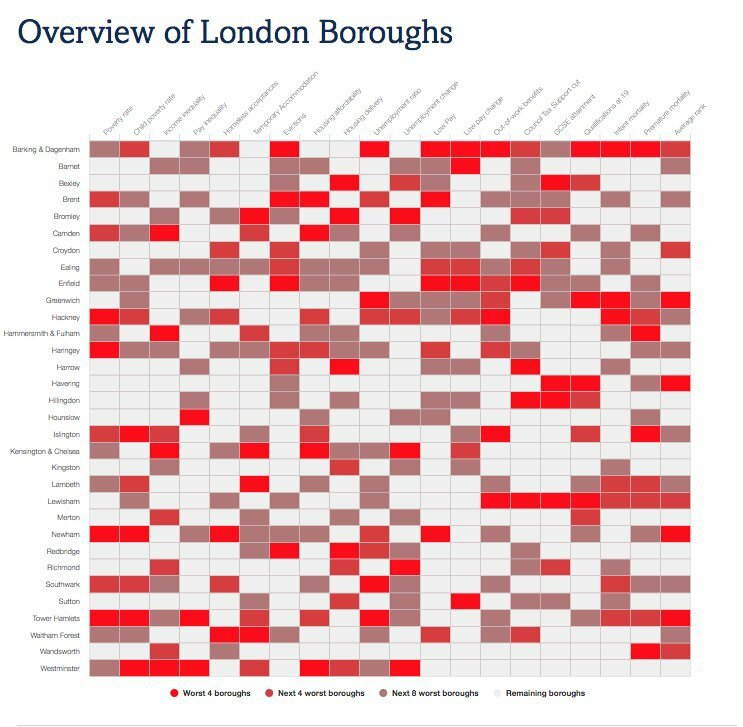 The first section gives a snapshot from the latest data: the deeper the red, the worse the problem; those coloured green are in the top half of London boroughs, which are performing better.